I could write several paragraphs on the history of this cocktail alone, but I’ll spare you all of that reading. However, I will encourage you all to do some research on your own. You will not be disappointed. (Provided you love cocktails, history, AND New Orleans.) I’ll post a couple articles in the comments if you’re curious. 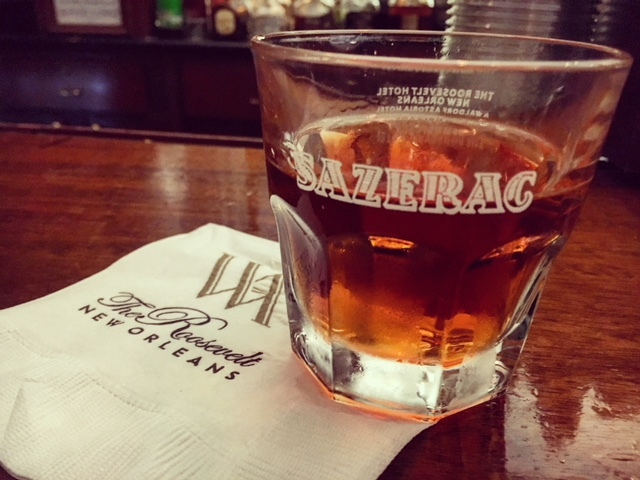 Originally invented over a century ago, the Sazerac was first served at a drug store in the Big Easy, by Haitian immigrant, Antoine Peychaud. The recipe was a combination of Peychaud’s homemade bitters recipe, absinthe, and brandy, the drinks original base spirit. Over time the recipe was modified to include rye whiskey due to massive grape shortage in France. Also, with abinsithe being banned in the US from 1912-2007, locally made Herbsaint was used as substitute to rinse the glass. Chill an Old-Fashioned glass. In a mixing glass combine the sugar, 3 dashes of Peychaud's Bitters and whiskey. Add ice, stir to dilute/chill. Coat the chilled glass with the absinthe, then discard the remaining liquid. Strain the mixture in the chilled, coated glass. Twist a lemon peel over the glass, then discard.